Ministry of Propaganda - 05/Mar/2006: "Black Mishnish"
The Mishnish Hotel is currently being painted black, apparently its original colour until the 1960s. Not everyone is happy with it, saying that the world famous colours shouldn't be changed. I'm not sure what to think yet, I think I'm a bit sad that it will change to black. I quite like the bright colours, I don't think black looks as nice with the red and blue houses next to it. But then again may be it's just a question of getting used to it? Still, it feels like imagining and getting used to a black Forth Rail Bridge (which is red and is unlikely to ever change colour). 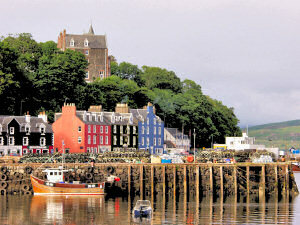 I'm hoping to visit Mull and Tobermory again, probably in 2007, I'll see how I react when I see it then. In the meantime thousands of parents will have to explain to their children what happened to the yellow house.